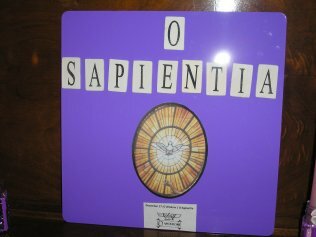 This year, I really want to spend a bit more time praying (and teaching my kids to pray) the O Antiphons. My goal is to help them recognize the Latin words and their English equivalents, in addition to better understand each of the prayers. 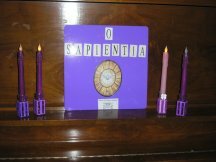 I planned to make a paper O Antiphons house like the one suggested by Catholic Culture, or even better yet, the wooden house created by Alice, Elizabeth, Suzanne, Ruth, Kelly, Kimberly, and Jessica. But between teaching catechism at two churches and chauffeuring kids to basketball, soccer and dance practices, I found little time to craft. I figured that if I was going to make the house, I wanted to take the time to make it beautifully. So it didn't happen. Perhaps next year. I found a purple magnet board and wooden magnetic letters at Michael's craft store. The picture and symbols below the picture are from Jennifer Gregory Miller's O Antiphon Prayer Companion. It's a wonderful booklet filled with prayers, an explanation of the symbols associated with each Antiphon, and even some suggestions for corresponding food or meals that could be served on each day. I put two electronic taper candles on each side of the display and lit them. They will remain lit for the whole week. 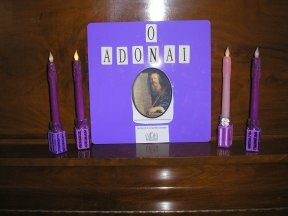 We will also listen to O Antiphons chant on the Fisheaters website. What a wonderful, and manageable, suggestion! I have linked to this on Pinterest. Thank you.